Welcome to Parallels Plesk Panel 10. This version of Plesk provides you and your customers with a streamlined user interface, many improvements, and many powerful new features. One thing you'll quickly realize is that all hosting-related functionality has been removed from your control panel. 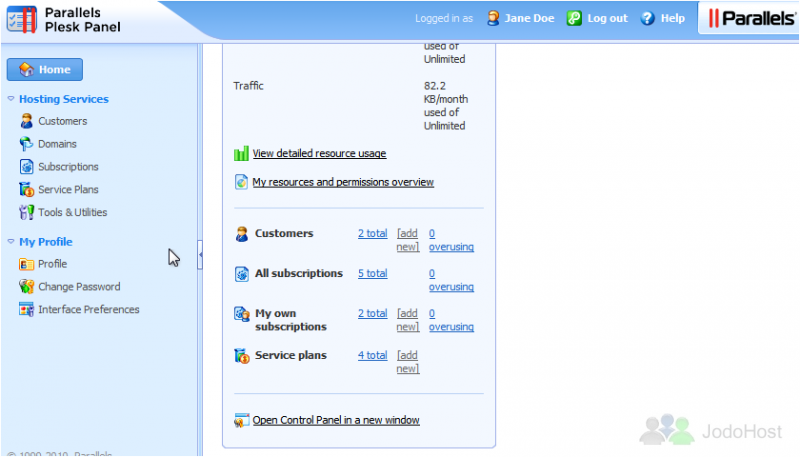 Plesk 10 is split up into two separate panels: the Server Administration Panel, which is devoted to administrator and reseller server and account operations, and the Control Panel, which focuses on hosting management. 1) Whenever you want to do something with a customer's account beyond what's in the Administration Panel, you will need to access the customer's Control Panel. Let's take a look around the Administration Panel. This is the home screen, which gives you an overview of your account. 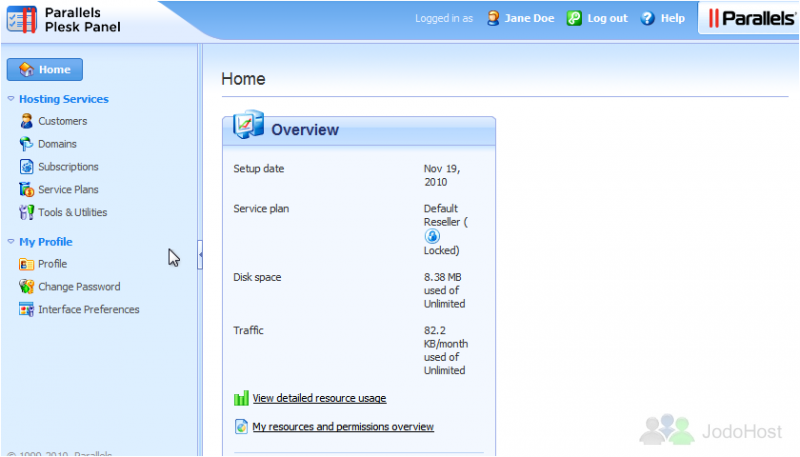 View your current service plan, disk space usage and traffic consumption. 2) Here you're given links to access most of the important areas of the panel. And then of course everything you could need is available in the menu. 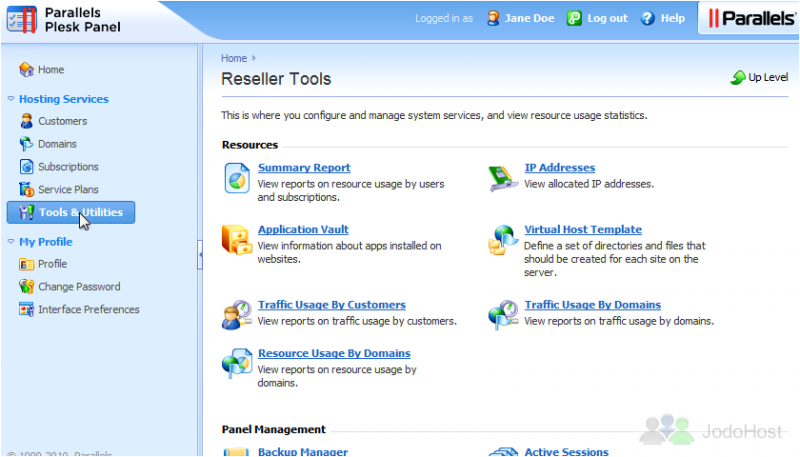 Let's check out the Hosting Services section, starting with Customers. This is where you manage customer accounts: create new accounts along with service subscriptions, manage existing customers, and remove accounts. One of the most important changes in Plesk 10 is that hosting services have been restructured. Instead of clients, you now have Customers. Customer accounts never expire and don't actually provide any hosting services by themselves. 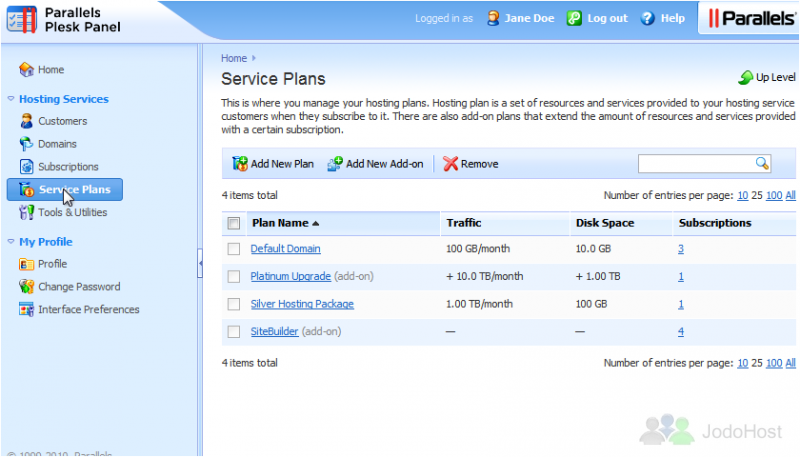 When a Customer signs up for a hosting plan, a new Subscription is added to his/her account. 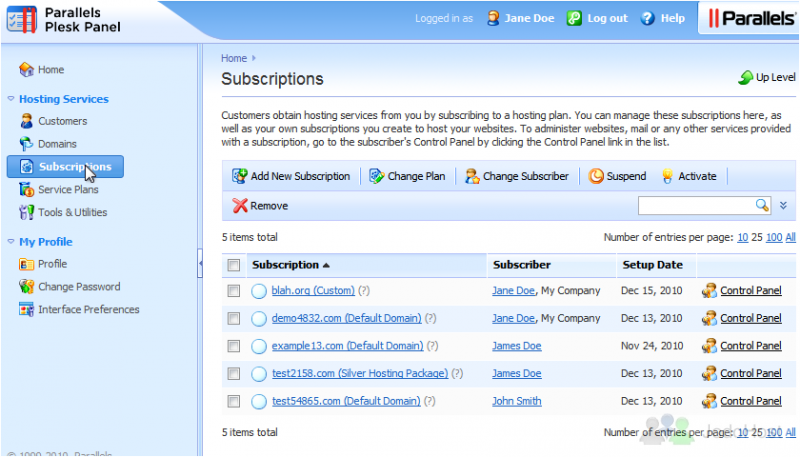 Subscriptions are what actually provide hosting services to your customers. 3) To manage Subscriptions, click this link. Here you'll find a list of all the subscriptions under your reseller account: your customers' subscriptions as well as your own. 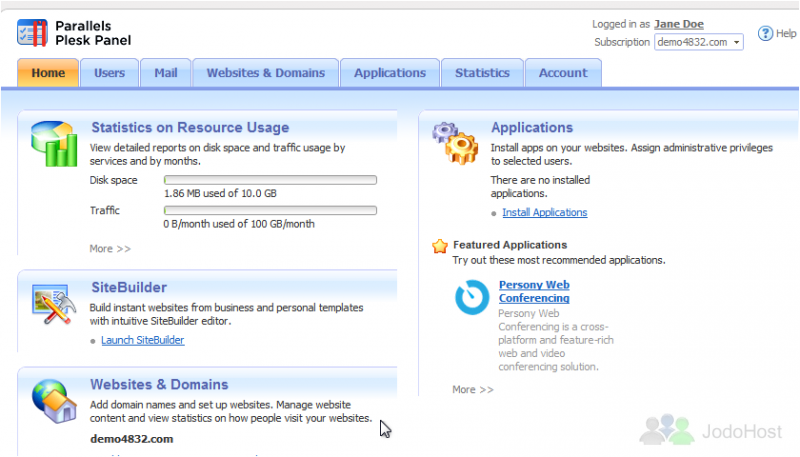 Another change in Plesk 10 is that hosting templates have been replaced with Service Plans. Whenever you create a new subscription, you're given the choice between creating the subscription manually (using no plan) or assigning it a plan. Service Plans can be managed here. If a subscription uses a certain plan, any future changes to that plan will automatically be applied to the subscription. This is known as synchronization. If you ever make customizations to a subscription, it will be locked from synchronization and no plan changes will affect the subscription unless it is unlocked. Similar to Service Plans, Add-on Plans can also be assigned to subscriptions, giving them additional features above and beyond what already comes with a subscription's Service Plan. 4) Now we'll take a look at the Domains page. 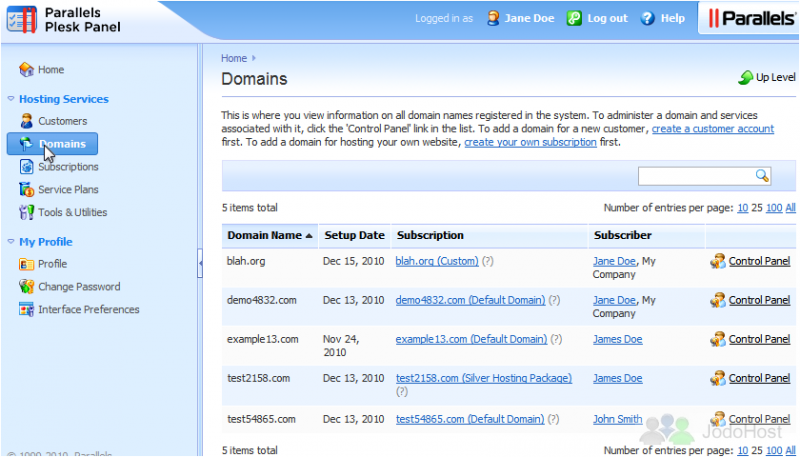 This page gives you a list of all the domains in the system, their setup dates, associated subscriptions & subscribers, and a link to their corresponding Control Panels. You can't actually do anything with the domains directly from this page; if, for example, you wanted to delete a domain from someone's subscription, you'd need to access their Control Panel first. 5) The final item in this section of the menu is Tools & Utilities. This is where you configure and manage system services, view resource usage statistics, set up backups, customize your panel branding, etc. 6) Let's return to the Home page. As a reseller, you can create subscriptions for your own account. 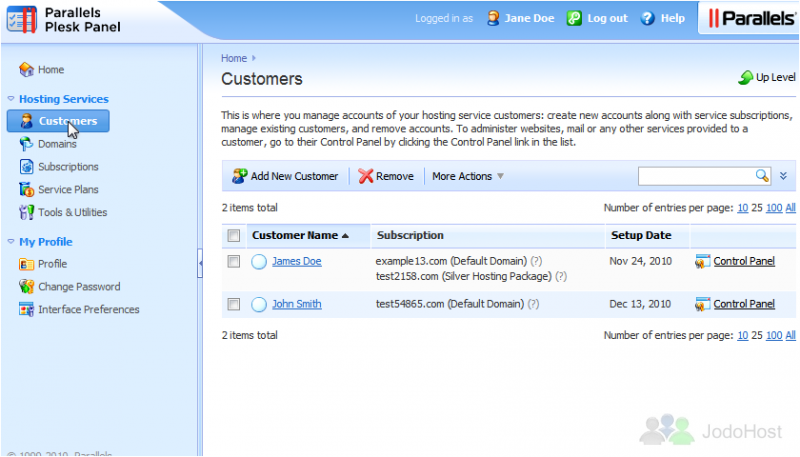 Just like with Customer accounts, you'll manage them from the Control Panel. 7) Click the link at the bottom to open your Control Panel in a new window. As you can see, the Plesk 10 Control Panel for end-users has a much simpler design than in Plesk 9, but it's still just as powerful. For assistance using the Control Panel, you may want to watch the tutorials in the end-user series. Now that you've seen all the main areas of Plesk, be sure to check out the tutorials that follow if you ever need help performing more-specific tasks in Plesk.